yep, grandma watched the boys for us while james and i had a "DAY DATE" and we finished up our 'STUFF' for everyone!! yayayayayaya!!! it was nice to just get away for a couple of hours and do what we had to do....it was funny cause we stopped off at SUBWAY and i jumped off and james stayed in the car....with the kids...that were NOT IN OUR CAR!!! heheheheh...we were soooooo use to one of us jumping out and the other staying with the kids that it was just INGRAINED in us to do it!! as i was ordering, here come james out of the car and we BOTH laughed cause we were sooo use to it!! anyway, just a GREAT friday for us!! it is soooo close!! WOW!! hard to believe that thanksgiving has come and gone and it is on to CHRISTMAS! time just seems to fly by! i look at my boys and just MARVEL that alex is now 7, matthew is now 5 and the BABY is now 2!!!! wow! this year we had a great thanksgiving...we went to the in laws and then spent some time with the kids and their family! it has been a NICE relaxing time!!! now alex and daddy are on the boat for a little fisihng while i stay at home with the little ones!! NICE! well, FACEBOOKING has taken over all my time with blogging...i am sad that i have not been keeping up with my blog!! :( i love having this record of my life...well, i guess AGAIN, i need to start working on it!!! AGAIN!! i think i have said this at least 3 times, right>!>! well, if you want to follow me on FACEBOOK just look me up by queengonzo at yahoo dot com....i would love to follow YOU there too!!! ok, gotta run finish my cleaning and stuff....HAPPY THANKSGIVING YA'LL!!! but just wanted to say.....MOM, HAPPY BIRTHDAY!! MY BOYS STILL LET THEIR BALLOONS GO TO HEAVEN SO THAT YOU CAN HAVE THEM TOO!! WE LOVE YOU AND MISS YOU VERY MUCH!!!!! well, since i am back, i need to update on myself....i have had a fun filled last couple of months of FINALLY getting myself checked out....i have ALWAYS had a lot of problems in my life such as GASTRO, FIBRO, etc....so, i finally got myself an appt with a GASTRO, a RHEUMOTOLOGIST, and my dr and got things rolling...i have had MRI'S, ENDOSCOPY/COLONOSCOPY, UPPER GI's...i am now on 3 medications (2 for pain, 1 for gastro) and it is pretty bad...but i am FINALLY getting myself taken care of!!! well, MATTHEW started school last week and he is doing AMAZING!!!!! YESTERDAY, he READ for the FIRST TIME!!! nad what do i mean about that? well, the teacher showed ome on monday a sheet of paper with 3 words on it (MATTHEW, MOMMY, DADDY) AND she would flip the card over and he would then SAY dada, when MOMMY came up he would point to MEEEEEE and when MATTHEW would come up, he would point to himself!!! is that not MAAZING?!?!?!?!?!??!?!?!?! what a MIRACLE!!! so today, we BAPTISED TRISTAN (our new GOD son! ), JOSHUA & finished getting MATTHEW baptised....he WAS already baptised in the operating room on his day of birth but he had to be introduced to the community and annointed with the oils! it was GREAT!!! our son JOSHUA Godparents and our family have a GREAT bond....trisha (my cousin) actually introduced james and i!! and she met HER hubby that day of the party where i met james too!! :) we were PADRINOS in thier wedding and they were our PADRINOS in our wedding....we baptised their son Tristan!! :) it was a really nice ceremony...the decon said that that was the FIRST time he had ever baptised someone that had had an EMERGENCY baptism!! he said it was REALLy specail and rare for that to happen...he said that most babies don't make it....such a MIRACLE our little guy is! so, here are some pictures of that beautiful day! for matthew!! :) i know sooooo last minute but it just couldn't be helped! we decided about 2 weeks in or less that.....but it went SOOOO WELL! we had NEVER had so little time to put it all together...we also had a BAPTISM on SUNDAY for both JOSHUA, TRISTAN (i am a GOD MOTHER NOW!!!) and MATTHEW!!! soooo we were REALLY BUSY! anyway, we had a GREAT turn out and it was SOOOO NICE to see so many of our friends and family there!! we had about 60 people there...just PERFECT! sooo, i just wanted to share with you some pictures of this day!! went out to dinner for MATTHEW'S BIRTHDAY! just had to share some pictures with ya! if you can't tell, i FINALLY got my program working to download my pics from my camera (thanks BIL! 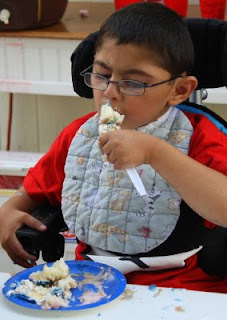 )...sooo, we went and took matthew out to eat at GOLDEN CORRAL because there is PLENTY of yummy stuff for him to eat there and he LOVES to eat there!! my MIL and FIL and our family went ther and it was just sooo nice to watch him eat and such....towards the end of the dinner, we had the wait staff come and SING for him HAPPY BIRTHDAY and it got me going...i did not THINK that would happen but there i was, CRYING...and i mean REALLY crying! i don't know...it was just so AMAZING to watch him be sooo happy and soo excited as we all sang to him...he was just sooo HAPPY...again, he is FIVE YEARS OLD!!! i remember it well when they didn't expect him to live past his first DAY!!! THANK YOU GOD FOR EVERY SECOND OF MY MATTHEW'S LIFE!!!! it was so neat because a fellow diner gave him $5 and he got soooo excited!! sooo, here are some pictures of his DAY!! i just had post again.....this morning, when i went in cause i saw that matthew was stirring....i went in and my BEAUTIFUL, AMAZING, SMART, AND MIRACLE OF A BOY was saying something....GUESS WHAT HE WAS SAYING?!?!?!? my beautiful boy was saying..."FIVE, FIVE, FIVE..." OVER AND OVER AND OVER and he had his hand up SHOWING ME HE WAS FIVE!!!!!! he was facing the wall and he was looking at his hand and just saying that with a BIG SMILE over and over again!! :) he turned around to me and held up his hand and kept saying 'FIVE....FIVE!!" just soooooooo amazing! he is so HAPPY that today is his birthday....yesterday, when we told him it was his birthday today he started to JUMP up and down and get sooo happy!! THANK YOU GOD FOR SUCH A MIRACLE BOY!!! WE ARE SOOOOOOOOOOO BLESSED!!! HAPPY 5TH BIRTHDAY, MATTHEW ISAIAH!!! ooooooohhhhhhh mmmmmyyyyyy GOOODDDNNNEEESS!!! our baby boy is FIVE YEARS OLD!!! wow, THANK YOU GOD for EVERY second of his beautiful life!! we have been so blessed to have him in our life....no words can describe the LOVE we feel for this special little boy!! 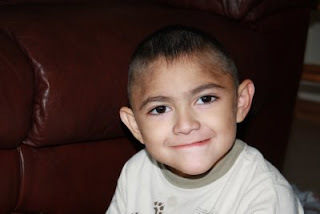 FIVE LONG YEARS AGO, the drs told us when he was about an HOUR old that "we don't think he will make the transport (to the other hospital or surgery)" and they also told us >"i am sorry but your son will not make it thru the night"......BUT BUT BUT....they also told us, "WE MIGHT HAVE A MIRACLE ON OUR HANDS" and one of the MOST important statment made to us was "THERE IS SOMEONE MUCH HIGHER THAN ME (the cardiothorasic surgeon) AND THE DRS WORKING HERE"...an ACKNOWLEDGEMENT that OUR GOD was at WORK on this little MIRACLE BABY BOY!! OUR PRAYERS were being ANSWERED!!! 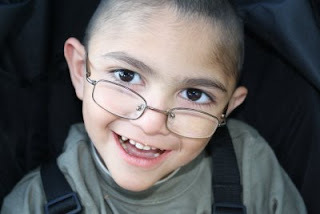 to see him now, MOST don't know the STRUGGLES this little boy has been thru....until you realize that he does not talk, and has MANY MANY scars from surgeries and that he does not walk or eat.....you don't SEE any of that because he BEAUTIFUL BLINDING SMILE and GEORGEOUS HUGE EYES with those CRAZY eyelashes captivate you!! he has never met a stranger (unless he is a DOCTOR/NURSE) that he didn't LOVE!!! he is such a happy boy all the time!! ALL THE TIME!!! we are so amazed that he is OURS!!! FIVE YEARS OLD....FIVE BEAUTIFUL AMAZING YEARS with him!!! he is the most amazing CHILD ever!! i really mean it! 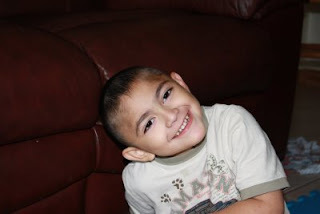 he is ALWAYS smiling and wanting to sit in your lap, give you hugs and kisses and wanting to READ!! he LOVES books!!! he LOVES flipping thru the pages of a magazing to look at stuf...he loves his MOVIES and he LOVES to talk on his COMMUNICATOR! he loves to be where ever we are...he enjoys sitting in his feeding chair and being at the table with us...he loves to chew on his food and loves to eat whatever we are eating...he is so AWARE of EVERYTHING now...just shows how much more he has grown...he is always just so happy....he loves his DADDY and LOVES to be with him!! he LOVES his brothers....his BIG BROTHER ALEX is his idol! he loves to see what he is doing and try to do it too! his BABY BROTHER JOSHUA...he LOVES to torment him! he wants EVERYTHING he has...it is so AWESOME to see him develope MENTALLY because that means he understands EVERYTHING!! SOOOOOO, MATTHEW ISAIAH....WE ARE SO PROUD TO BE YOUR AMILY...WE ARE SO BLESSED TO HAVE YOU IN OUR LIVES!!! THANK YOU GOD FOR OUR LITTLE MIRACLE!! YOU HAVE TOUCHED EVERYONE THAT KNOWS YOU WITH YOUR STORY!!! WE LOVE YOU MATTHEW ISAIAH!!!!!! if you want to read his MIRACLE STORY...click HERE..
i will post his NEW montage SOON!!! well, today, joshua has an EEG today....and to make that just a BIT worst...it is SLEEP DEPRIVED ONE!! YIKES! so last night, i held him back from sleep for 2 hours PAST his sleep time and then woke him up 2 hours BEFORE he normally woke up!!! and let me tell you, he did NOT want to wake up!!!! he was soooo cute, he was rolling around the bed moaning because i had the lights on and trying to open his eyes! CUTE! he even laid with his head over the side of the bed....just pitifully looking at me! anyway, he also got bloodwork done on monday and he was AMAZING!! they had to take out 4 vials of BLOOD!!! and thru it all he was just amazing!! THANK YOU sooooo much!! this organization was the one that accepted Matthew as a WISH KID....we were soooooo thrilled!!! soooo, here is my post on this WONDERFUL ORGANIZATION!!! i previously posted about GIVE KIDS THE WORLD VILLAGE and now this is about the WONDERFUL ORGANIZATION that BROUGHT us TO GKTW!!! MAKE A WISH is an amazing organization that grants WISHES to children with life threatening and terminally ill children.....unfortunatly my child falls into this category....but because he did, my beautiful amazing SON was BLESSED with a wish to DISNEY WORLD FLORIDA!!!! a once in a lifetime WISH!! and all i can say is BECAUSE of this WONDERFUL ORGINZATION it happened!! 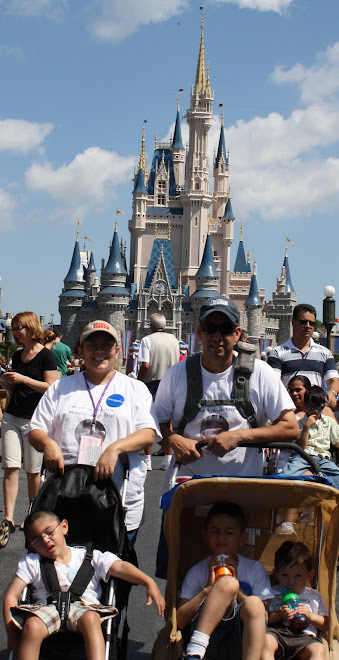 first let me tell you that i will work HARD to try to bring awarness to this foundation....it is because of THEM that i met so many OTHER families there at GKTW that had been granted wishes....other SPECIAL kiddos and their families that have been thru what my son has gone thru or WORST!! just amazing...they grant these kids their WISH....something that is so special to them and then make them feel like they are the most SPECIAL KIDS OUT THERE!! this foundation goes out of it's way to make these kids know that they are LOVED and that they are HONORED to be with these kiddos and their family....they don't just hand you the wish and are gone...no, they make you feel like they are BLESSED to be in your childs presence!!! and it is all about the child!! this SPECIAL child that has been THRU SOOOO MUCH in their little lives.....they are the REASON that they are here!!! what an AMAZING organziation!! you can DONATE directly TO our local MAKE A WISH FOUNDATION thru this LINK they have several WAYS you can make a donation! you can even donate your TIME to help them by VOLUNTEERING!! some day, GOD WILLING, i would love to be a volunteer there! you can buy something from their STORE!!! it is called the MAKE A WISH MARKETPLACE!! you can purchase some items knowing that it goes towards the WISHES of these SPECIAL KIDS!! Maggiano’s Little Italy locations across the country will encourage their guests to Eat-A-Dish for Make-A-Wish to help raise funds for the Make-A-Wish Foundation®. The promotion includes donations through the purchase of feature menu items, gift card sales and the purchase of wish stars. THEN there is the BETTY CROCKER SIRRING UP WISHES and you can go vote EVERY DAY THRU THE MONTH OF MAY for a certain MAKE A WISH location nearest you and they are granting 12 WISHES IN 12 WEEKS!! to sign up it is FREE and you get some GREAT BENEFITS such as FREE news letters and recepices!! GREAT stuff! i am going to VOTE every WEEK for our LOCAL MAW!! help them make theses SPECIAL KIDDOS WISHES COME TRUE!! i am going to also try and update and let everyone know when there is a new FUNDRAISNING EFFORT by MAKE A WISH!!! JUST coming on really quick to wish ALL THE MOMMIES OUT THERE A VERY HAPPY MOTHERS DAY!!!! my family is my JOY and i always feel sooooo BLESSED to have them in my life!!! i know MANY ladies out there that have wanted children sooooo badley but for whatever reason, they were never able to have children..... we've been blessed 3 times in our life and 2 angel babies....THANK YOU GOD!! my beautiful boys gave me a WONDERFUL WEEKEND....we did a WHOLE bunch of stuff together as a family...and my boys bought me some BOOKS!!! and then on saturday, after a day of finishing our GARDEN that i have wanted to do for a long time (daddy and the boys did that for me), james and i were able to go take in a MOVIE for the first time in YEARS by ourselves!!! we watched 'X-MEN...WOLVERINE" which i HIGHLY recommend if you like that series!! anyway, it was really nice to just watch and adult movie...but we missed our boys!! our oldest neice watched the boys for us....then on mothers day, gave me a dozen roses and some of my FAVORITE chocolate!! after a great day at church, we had breakfast at our home (barbaco and tamales YUMMY!!) we went to my in laws for a BBQ and just had a great time together!! it is so awesome to see the kids with their grandparents....the love is MUTUAL!! well, all my prayers to all the mommies out there in the world....BE STRONG, SHOW LOVE, AND KNOW THAT YOUR ARE BLESSED!!! KIDS ROCK WHEELCHAIR by KIDSUP!!! here is a PICTURE of what he is getting EXACTLY!! except we are going with the GREEN instead of the orange.....we are soooo excited because it is going to fit his needs exactly! why? because it actually ROCKS and is MEANT for him to extend himself like he does when he gets excited!!! that is AMAZING!! it is not a STATIC CHAIR....it moves with him if he gets excited and jumps around, we can still push him OR he can self propel himself!! :) i LOVE IT!! AND we can tilt him when he needs to sleep or relax!! soooo AWESOME!! it has been almost 4 years since he had a chair....the other one was falling APART on us!! 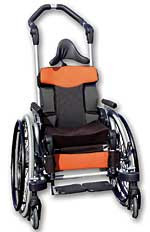 here is a VIDEO on what this wheelchair DOES!! VERY INTERESTING!! i will let ya'll know when it comes in!! WOOOOOOOOOOO HOOOOOOOOOO!!! well, THANK YOU ALL for the thoughts and prayers....we are now AGAIN on HIGH ALERT... we got REAL COMFY with him not having ANYTHING in over a year....i am very happy it didn't happen in FLORIDA and of course, matthew had to pick the PERFECT time when no one should be NEAR the hospital with all this FLU EPI!! ANYWAY, please just pray that he SLEEPS COMFY tonight and these sz go away AGAIN! !